It all starts at a jumble sale. Sue Lawton notices a handbag that came from the Mysterious Orient. Her mother does not think much of it, but for Sue it is love at first sight. And the same seems to be true for the bag; it seems to grin at Sue and then falls right off the stall and onto her arm. Sue calls the bag Henrietta, saying it has personality. It turns out Henrietta has more than just personality, but it takes several episodes before Sue understands the full nature of Henrietta. We get the first inkling when a thief then snatches Henrietta, and then finds his hair super-growing to abnormal lengths when he takes a comb out. He ends up begging to be arrested. Sue finds more weird things happening when she puts things in Henrietta, such as a pair of plimsolls that give a girl super-powered sports ability when she is teased for lack of them. Sue eventually catches on that Henrietta is a magic handbag. She can put spells on things that Sue puts into her. So Sue has to be careful what she puts in there. If Henrietta does not like what is put into her or gets mischievous over it, Sue or someone else will pay the price. Henrietta can also bewitch people and objects outside of her as well. By episode three the premise is established for Jinty’s magic companion story that lasted for three years. 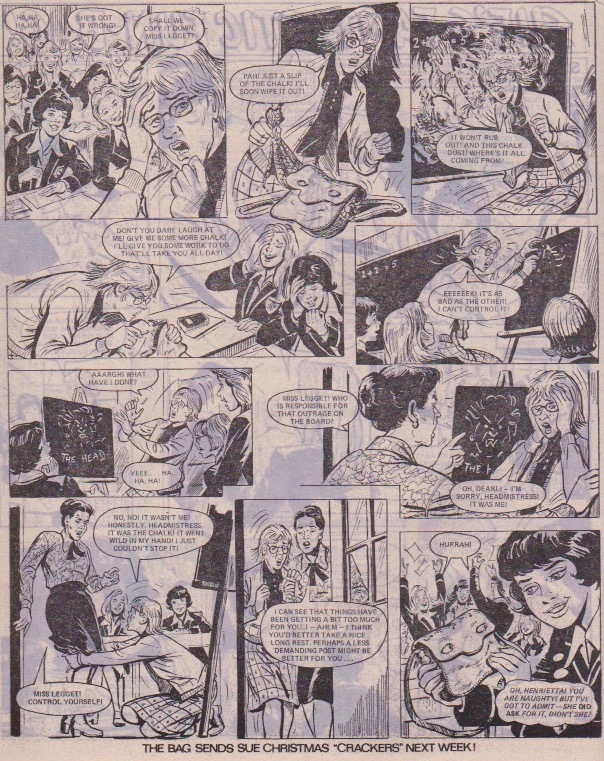 Incidentally, “Gaye’s Gloomy Ghost” followed a similar pattern of taking several episodes to set up its premise, suggesting that Fun-Bag and Gloomy Ghost had the same writer as well as the same artist. But unlike Gloomy Ghost, which ended with a definite conclusion, Fun-Bag ended with a regular episode. But back to Fun-Bag. Once the premise is established, the stage is set for a magical handbag that makes all sorts of things happen every week that are guaranteed to give loads of laughs. A lot of the fun comes from Henrietta having a mischievous streak and taking cues from things she overhears or things that are put in her to cast a spell and have a bit of naughtiness. One example is a Major who just won’t stop talking about his safari days and is the ultimate bore. After a cue from Sue about his really living his hunting days, Henrietta casts a spell that has the Major reliving his safari days – literally. But, as usually is the case when Henrietta casts these spells, things get out of hand, and Sue is among those who fall into his safari traps. In one Easter egg episode, Sue and her friends find it a pity to break such a pretty Easter egg. Henrietta takes the cue to make the egg unbreakable, leading to loads of laughs as they try to break it. It has the additional, unexpected bonus of foiling a thief who was trying to steal a garden gnome, and Sue and her friends are rewarded with Easter eggs. Other times Henrietta casts spells because she is annoyed, such in one episode where Sue plays a trumpet very badly, or because Sue succumbs to human greed and tries to take advantage of Henrietta. This happens in the third episode once Sue catches on to Henrietta’s power. In one episode, Mrs Lawton, who still does not like Henrietta, buys a replacement bag for Sue’s Christmas present. Henrietta is in earshot and is so furious that she causes trouble at Sue’s present-wrapping session. She is placated once she finds Sue has bought a present for her and she starts helping with the present-wrapping. And Mrs Lawton does not try to replace Henrietta again. Sometimes Henrietta causes trouble unintentionally, such as when she misunderstands something or is sleep-casting (casting spells in her sleep). In one episode Henrietta sets the whole class turning Indian because she keeps misunderstanding Sue’s orders to have girls bury the hatchet and such. Sue ends up washing Henrietta’s ears out, saying she needs it. In some episodes the spells seem fun at first, but they soon get out of hand. In one episode, Henrietta turns Mum’s glasses into X-Ray specs. Sue thinks it is great – until the spell gets too strong and she urges Henrietta to remove it. Of course there are the episodes where Henrietta uses her power to punish people, such as the bag-snatcher who takes her in the first episode. People who appropriate Henrietta and put unpleasant things in her, such as chalk or a can of worms for fishing, soon receive poetic justice once she puts a spell on the things she puts in there. Plenty of episodes deal with punishing bullies who range from school bullies to workplace bullies, and criminals, fraudsters and other unsavoury types, and practical jokers and troublemakers . And there are episodes where Henrietta and Sue lend a hand, sometimes somewhat accidentally from Henrietta’s mischievous streak. In the episode celebrating the Queen’s Jubilee, Sue is wondering what life was like when the Queen was actually crowned 25 years ago. Henrietta puts a spell on the punch that has people acting like they were 25 years ago; acting and dressing like school kids and such. Sue saves some of the punch for the Golden Jubilee. 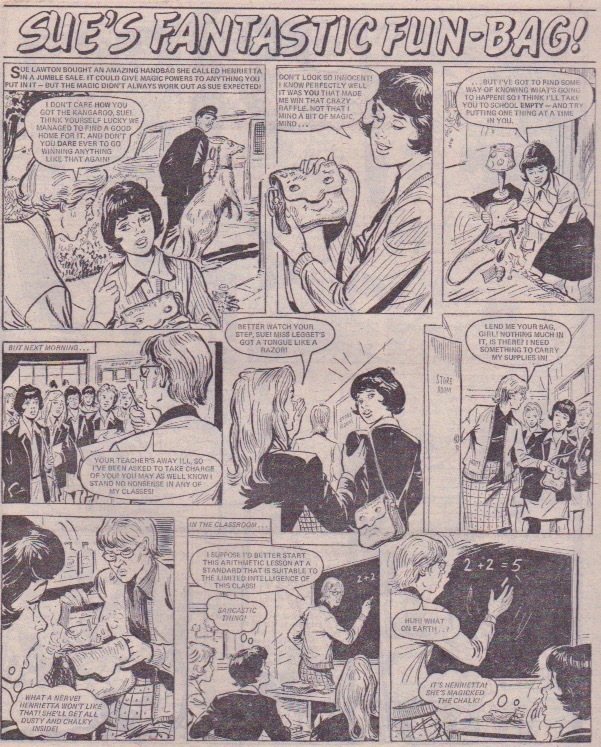 Other times Henrietta uses her spells to go to the rescue, such as one episode where she diverts Sue from booby traps being laid by the school joker. The joker is furious – and then gets a nasty shock when she is faced by the angry headmistress, who did fall into her traps. One of the strengths of Fun-Bag comes from not only the magic and laughs, but from the fact that Henrietta is a flawed character. She is mischievous, gets things wrong, has tantrums, gets very naughty, and gets things wrong. And sometimes her spells do not work out as she expected. For example, in the trumpet episode, Henrietta’s spells to stop Sue playing rebound a bit, and Henrietta ends up a bit battered. Or things do work out by sheer luck. For example, Henrietta’s bewitchment of the Major has gotten badly out of hand and caused serious trouble – but then it unwittingly has him capturing a real tiger that escaped from the zoo. And another of its strengths is its variety. In many humorous magic companion stories, the humour stems from the magic companion being somewhat goofy. Sometimes it’s because their spells tend to backfire (“The Zodiac Prince”), or they do not understand some things because they come from different time periods (“Gaye’s Gloomy Ghost”), or they take things literally or to extremes (“Her Guardian Angel”). This occurs in Fun-Bag as well, but it is rotated with humour that comes from giving people comeuppances, coming to the rescue, or taking the protagonist down a peg if she gets a bit above herself. It is not surprising that Fun-Bag lasted well in Jinty. It spanned three years, rivalling “The Jinx from St Jonah’s” for longest-lasting regular humour strip. So, is Hugh Thornton-Jones the illustrator of “Wee Sue” in Tammy? He was one of Sue’s illustrators. She had several: Mario Capaldi, Hugh Thornton-Jones, John Richardson, Richard Neillands, John Johnston, Robert MacGillivray, Barrie Mitchell and Mike White.